Ok, are you ready for this? I know... WOW. 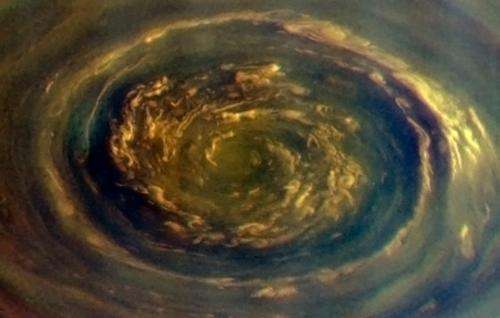 This swirling maelstrom of clouds is what was seen over Saturn's north pole earlier today, November 27, by NASA's Cassini spacecraft. 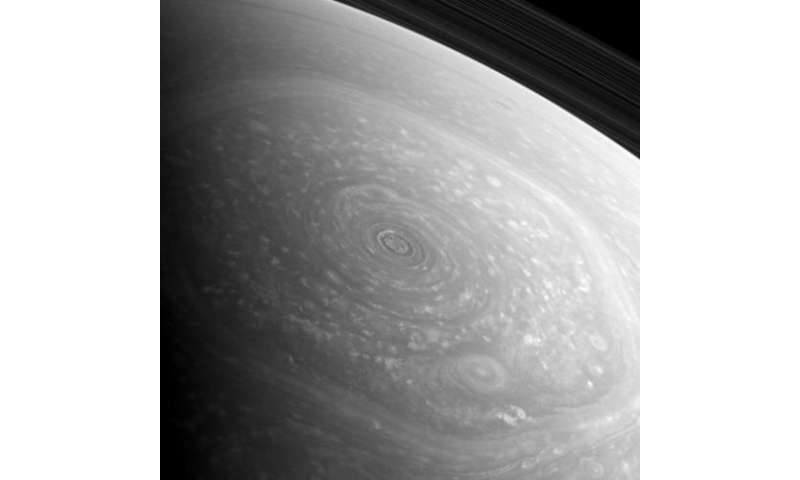 This is a raw image, acquired in polarized light, from a distance of 238,045 miles (383,097 kilometers)… all I did was remove some of the hot pixels that are commonly found on Cassini images taken with longer exposures. I'll let this all sink in a bit until more information is available. 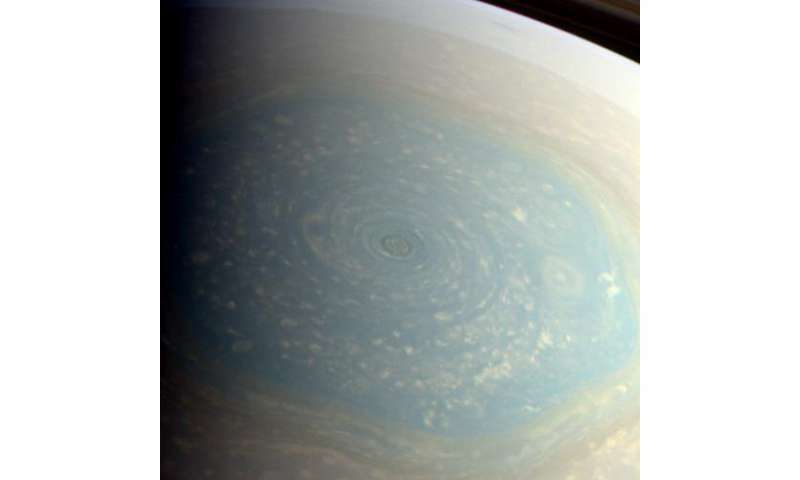 I'm curious how the "standard theory" explains this hexagon, I know other articles have described "perplexing" and "surprising" when discussing the hot poles of Saturn as well. Great use of false color to bring out the swirling clouds! Nice! Excellent. I guess that the gasses at the pole would be in down-draft? Wind speeds in that sucker go to about 550km/h. That's about twice as much as the strongest hurricane recorded on Earth. I dunno if it explains, but such a vortexes http://physicswor...a-bucket routinely. That's a swell experiment. 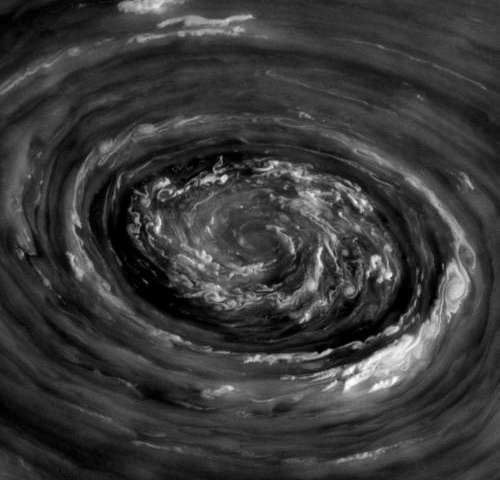 What do you think confines the vortex? In the experiment it's the bucket, the water reacts to the boundary of the plastic. What provides that mechanism here? I doubt its more atmosphere, denser or faster moving, that wouldn't confine it so dramatically. However, magnetic fields would have no problem doing so, and the plasma that makes up Saturn would most likely react electric and magnetic fields just as we would expect them to. What provides that mechanism here? A Corriollis force, I guess. The inertia constrains the rotating atmosphere fluid at place in similar way, like during its stirring in cylindrical vessel. The Hexagonal vortex is the result of a standing wave in the vortex boundary. These kinds of polygonal vortex structures were predicted a century ago, and have been demonstrated in the lab. Any polygon can be produced, but as the number of sides increase it becomes difficult to distinguish from a circle, and the edges become less stable as a result of fluctuations in the fluid. I've seen everything from 3 to 6 sides. You can do 2 sides as well, but it takes the form of an ellipse. Remarkable. Those are excellent close up images. This will encourage young ambitious bio/chem/Geo-engineers to make their own (planets) some day. Avoid the jury where there is a winner for the best design. And exactly how would one plan to do that? That would take an enormous amount of resources. a) It's actually hot enough in the core of it to be habitable? No. At 550km/h winds there isn't a human structure that would stand a chance, anyhow. c) If a giant habitable sphere could be made to float inside it?